This update is for November 19, and November 21-26. Much more progress has been made on the Gorgosaurus. 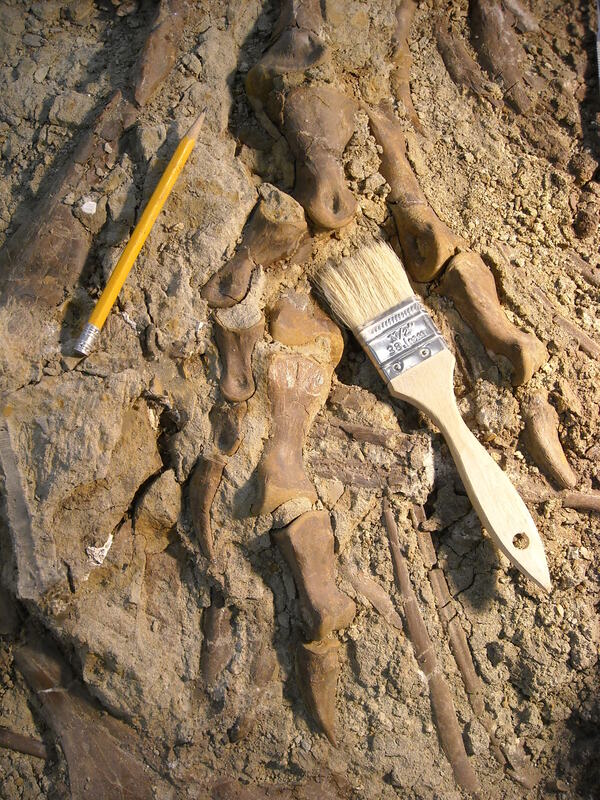 The left hind foot and much of the major limb bones are now uncovered. The whole left hind limb is complete and articulated, but the bone very splintery and requiring lots of glue. Next week I will use a homemade glue dispensing system, akin to an IV drip bag used in a hospital. This will glue not only the splintered bones of the leg but the flaky matrix as well. A recent meeting regarding this specimen has concluded that once this specimen is prepared on this side, it will be flipped over and worked from the other (original top) side. There are several reasons for this, one of which is that the skull is wanted for study by several researchers and will be CT scanned once finished. There appears to be no neck on the Gorgosaurus so this may be quite easy to separate from the rest of the body. All this added work will add several months to the preparation time. 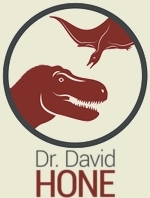 In this update I will address some issues involving crack repair on the Gorgosaurus block. Cracks are unstable areas and can expand or allow nearby rock to fall in further destablizing an already weak spot. It is often required to fill these cracks in as a temporary or permanent fix. Such cracks can be simply filled with epoxy glue which is airscribed or ground down with a high speed rotary tool with a wire brush. 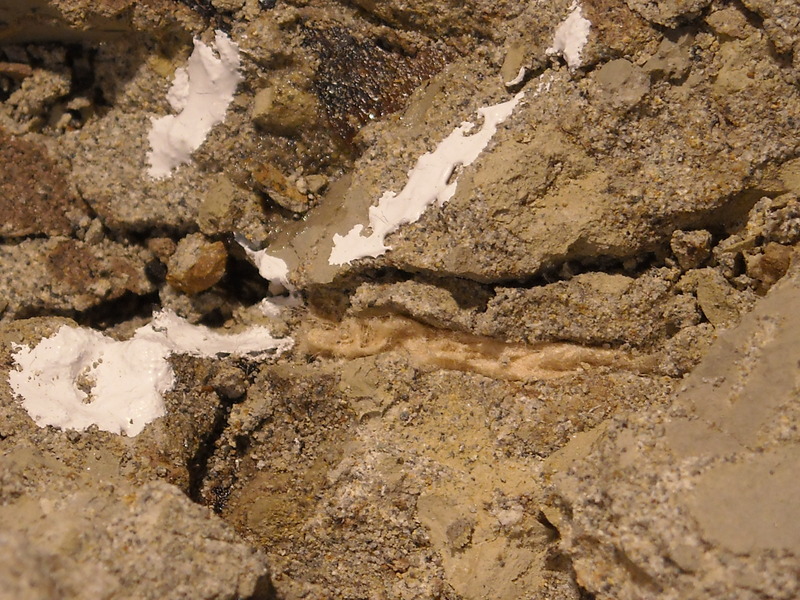 Or, the top of the glue can be airscribed to give it some rough rock-like texture and then reglued and loose sand from the block sprinkled on top when that glue is wet. 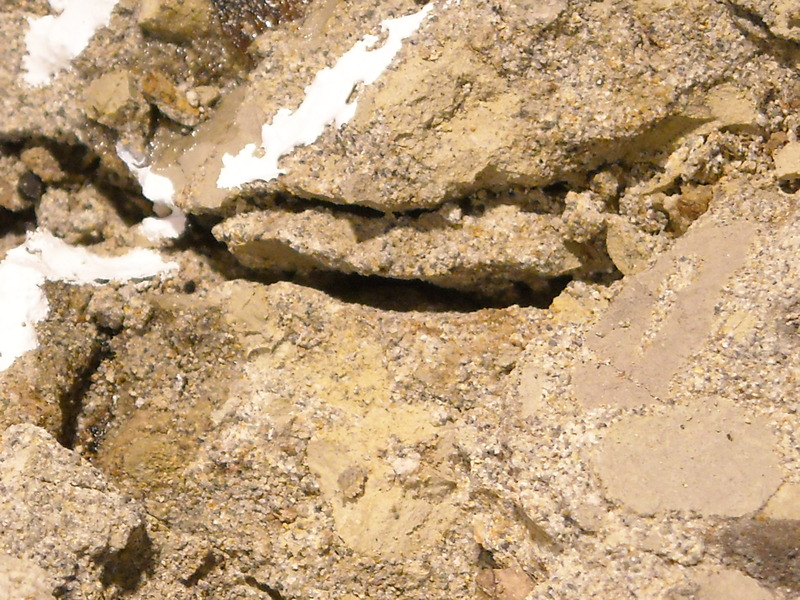 Once dry, the leftover loose sand is brushed away and the crack is well hidden. In the attached before, during and after pictures, one can see the crack virtually disappears. It is barely visible to you and I because we know where it was, but to a viewing public, the crack cannot be seen at all. 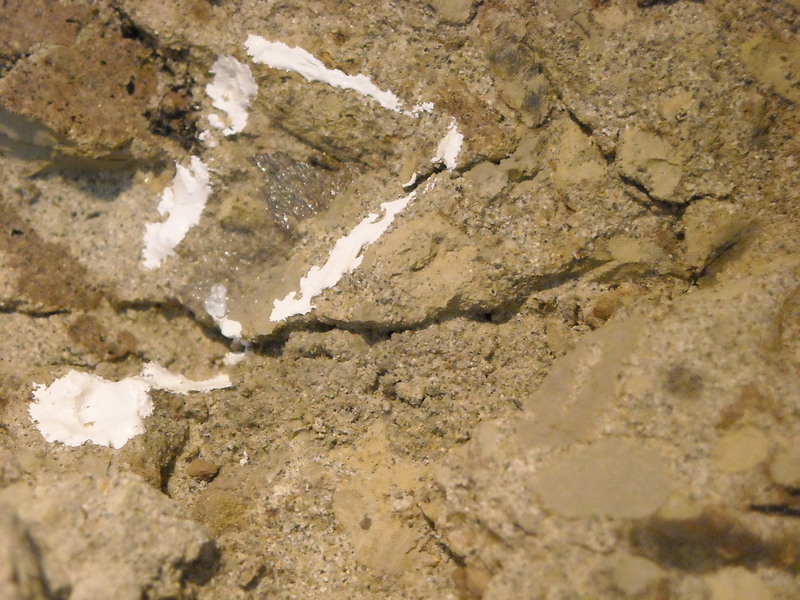 The camouflaging of the crack can be further achieved (if necessary) by regluing some random areas of the fixed crack and sprinkling a slightly different colored sand on top, and/or augmented by acrylic paints. 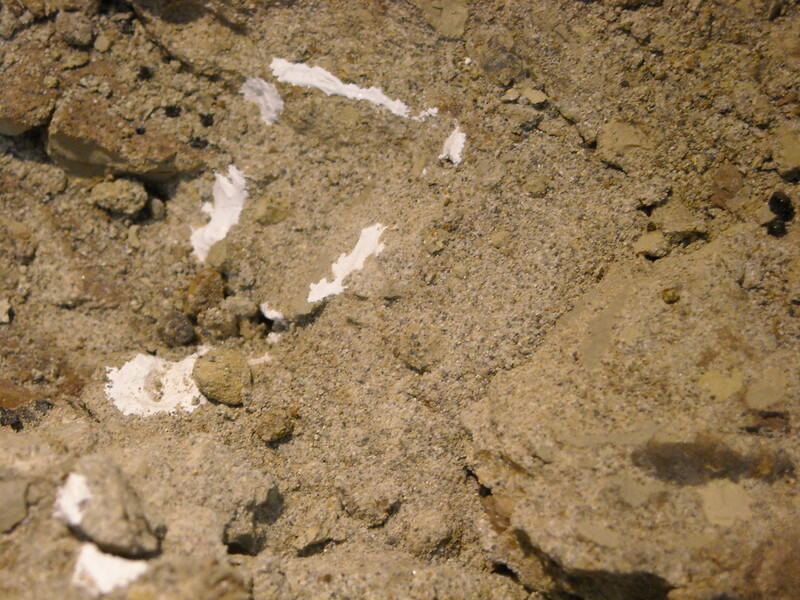 In the series of four photographs here, the crack is seen at the beginning, filled with tissue paper which is then glued, loose sand from block is sprinkled on top, and finally brushed away. This is another quicker technique that works very well. This crack was fixed when it was believed that the head would remain in the rock as found. Now that it has been decided to take the skull out, the fixed crack is no longer needed. When work resumes there, I can simply rehydrate the glue with acetone and my fix job will come apart easily. The fix job shown here took all of 2 minutes to do. 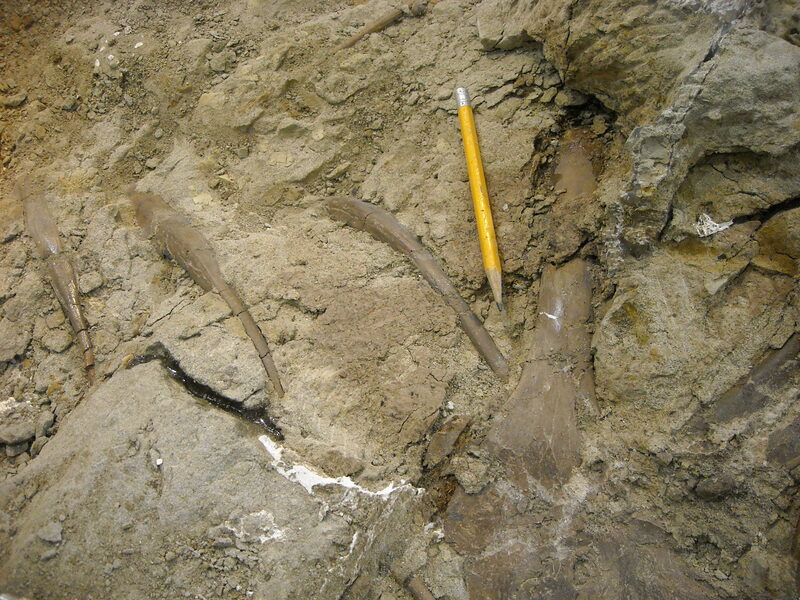 The other photographs show the preparation progress on the hind foot (top) and shoulder girdle region (below). The runny plaster of Paris poured in at the beginning of the project saved the day in a couple spots, stabilizing the loose rock long enough to be airscribed away. Instead of using plaster of paris, which can be a pain to remove because it really adheres to bone and matrix, I know that Amy Davidson at the American Museum of Natural History uses a coarse sand (with a contrasting color and texture to the matrix) mixed with butvar (don’t remember whether its B-76 or B-98) to fill large cracks in the matrix. It provides great stabilization, and is very easy to remove later. Great tip! I will have to try that on the Gorgosaurus!